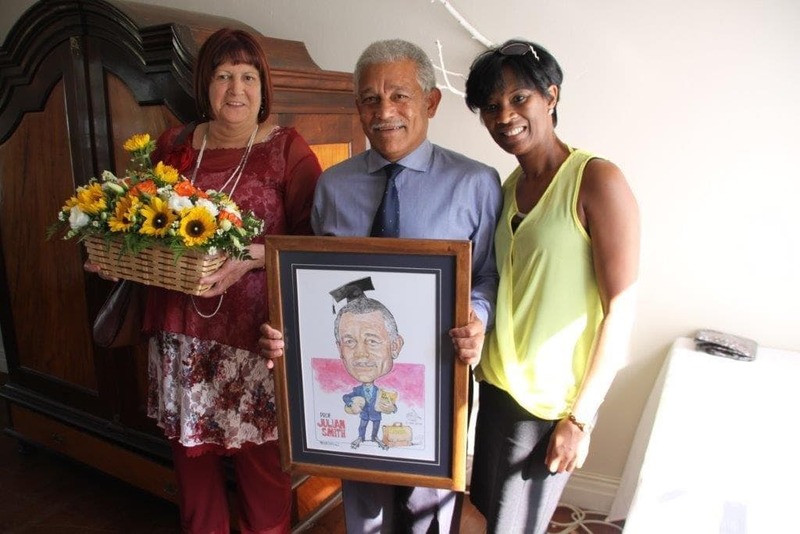 Casidra bid farewell to one its long-serving Board members, Prof. Julian Smith on the 12th March 2015 at Laborie’s Harvest restaurant in Paarl. Prof. Smith started serving as a Board member way back in 2002. During this time, he served and provided his invaluable leadership expertise within various Board committees, and was the chairperson of the Remuneration Committee for numerous years until his resignation as a Board member in November 2014. In his farewell message, Advocate Gary Oliver, Chairperson of the Board, expressed his gratitude and the wonderful privilege he had to have worked with Prof. Smith, since both joined Casidra’s Board more than a decade ago. He said that both of them had come a long way and served on the Board during the most difficult time when extremely tough decisions had to be made regarding the company, particularly during the strategic planning sessions where transformation was the main topic of discussion. “One of his most valuable words was when he said, put the issue on the table, let’s discuss it accordingly, taking into consideration people’s feelings, integrity and dignity”, said Adv. Oliver. Prof. Smith has an excellent educational, scientific and business background, and holds five qualifications from the University of the Western Cape. He started his career as a teacher in 1976 and became a lecturer. He later became a registrar at the University of the Western Cape and is currently Vice-Rector of the University of Stellenbosch. In particular, he has a very strong background and interest in sport, especially rugby, NGOs and cultural activities. Prof. Smith extended his gratitude towards the guests and staff members for the opportunities he had within the “Casidra family”. “I wish to thank you for signalling my exit from the Board in this manner. My joining of the Board happened unexpectedly, as did my leaving. I value Casidra as creating hope through expert support, above party political interests, credible and ethical, efficient and effective, fair and loyal, excellent and relevant, adaptable to change, effecting change and responding to change, sustainable, assertive, but modest”, he said. He further emphasised the value of experience at Casidra, which he had the opportunity of contributing towards, to develop and grow, by benefiting from the experience and expertise of Board members and Management, and building friendships and collegiality, as this cannot be switched on and off. Prof. Smith advised the company to remain aware of challenges, but also to grab opportunities, to continue proving that the cynicism about meetings is wrong, being aware of pointers regarding leadership and finally to take good advice to heart. “I extend my appreciation to successive Ministers, fellow Board members, previous Chairpersons, CEOs, Management teams and the rest of the staff members”, he concluded. Prof. Smith was embraced and commended by many people who had an opportunity to know and work with him, and for his good heartedness and professional guidance and leadership. His departure from Casidra’s Board has been deeply felt and described by many as a huge loss. It was indeed extremely difficult to accept his termination of service. His valuable inputs and guidance will be sorely missed. Casidra’s Board, Management and staff members wish him well with his future endeavours.